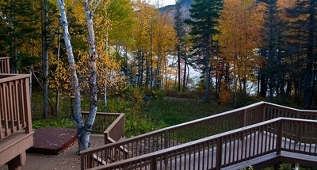 Lakeside Lodge nestles in a secluded setting among the trees on the banks of Deer Lake. It is located within walking distance of the Beach House restaurant and bar when they are open for business. The Lodge offer spacious open plan living areas on the main floor. A second living room complete with large screen TV and home theatre system and adjacent kitchenette is found on the lower floor. There is a further reading/sitting area on the second floor. The Lodge is accessed through a large mud room/laundry with heated tile flooring which opens directly off the car port allowing undercover access to the property. 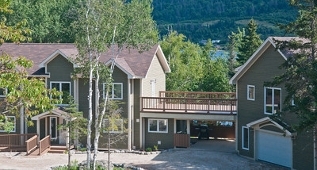 Lakeside Lodge offers a king master suite and 4 queen suites spread over three floors. 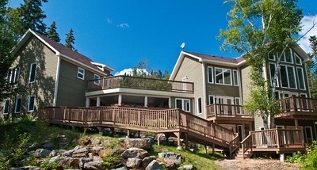 The property contains 5 full bathrooms and a half bathroom on the main floor. The master suite has a whirlpool tub and large walk-in shower.